The Justice Department is suing a Detroit suburb, Eastpointe, its mayor and city council, with violating the Voting Rights Act when it denied black residents an equal opportunity to elect city council members of their choice. The lawsuit, filed in the district court of eastern Michigan on Tuesday, challenges the at-large method of electing the city council of Eastpointe, Michigan. The voting process means that an elected official will represent the whole voting district as opposed to representing a separate ward. With whites the majority voters in the city, they could continue to elect white elected officials. “The lawsuit alleges that Eastpointe has racially polarized voting patterns, with white voters consistently opposing and defeating the preferred candidates of Eastpointe’s sizable black community. Although black residents comprise roughly one-third of the electorate and consistently support black candidates for local office, no black individual has ever served on the Eastpointe City Council,” stated the complaint. Of the over 32,000 people living in Eastpointe in 2010, over 12,000 were black, according to US Census data. A 2010-2014 American Community Survey estimated that black residents made up approximately 39 percent of the total population of Eastpointe, and approximately 34 percent of the citizen voting-age population. The complaint also alleges that changing the method of voting, by electing each councilmember from a district, could create an equitable opportunity for black voters to elect a candidate of their choice for the Eastpointe City Council, and seeks a federal court order implementing a new method of election. Eastpointe officials, knowing the lawsuit was coming, proposed changes including redrawing a district to give black voters a stronger chance to elect a minority candidate in December. Many communities in Michigan use at at-large system for selecting elected officials but some cities have adopted a district form of choosing council members. If Eastpointe had four voting districts, the black community is “sufficiently numerous and geographically compact to constitute a majority of the citizen voting-age population in one single-member district,” the lawsuit contends. 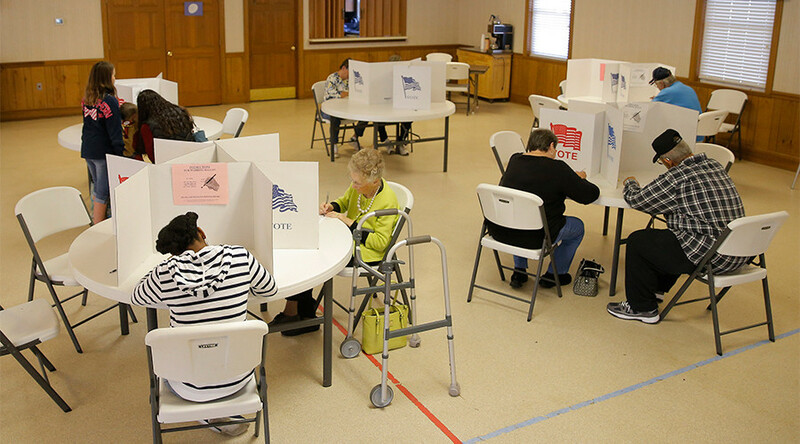 Eastpointe officials held a press conference in last year to discuss the Justice Department’s recommendation to overhaul its voting process for a geographic district-voting system. There are currently a mayor and four council members who serve staggered four-year terms. If a settlement is reached it would only affect city council members’ elections; the mayor would remain at-large.